For the model year 2012, Nissan Versa Hatchback comes standard with 1.8L 4-cylinder engine with fuel economy of 28mpg City and 34mpg Highway. Available in 9 exterior colors, the Versa Hatchback comes a long list of available technology features including Intelligent Key, BT Hands-Free phone system, XM Radio and Navigation system. The pricing for the hatchback starts from $14,380 and up. While the Nissan Versa Sedan enters the 2012 model year with an exciting, all-new design (please see nissannews.com for full details), the Versa Hatchback continues with its popular first-generation design, featuring one of the highest standard horsepower/torque ratings and one of the largest interiors in the entry-level segment. For 2012, the Versa Hatchback is offered in 1.8 S and 1.8 SL models, each equipped with a 122-horsepower 1.8-liter DOHC 4-cylinder engine. The Versa Hatchback S is available with a choice of 6-speed manual or 4-speed automatic, while the Hatchback 1.8 SL is offered exclusively with Nissan’s advanced Xtronic CVT® transmission. Refinements for the 2012 model year include the addition of the previous Premium Package content (Nissan Intelligent Key®, leather-wrapped steering wheel, Bluetooth® Hands-free Phone System, 16-inch aluminum-alloy wheels) as standard equipment on the SL model and four new packages for the S model – Convenience Package, 15-inch Aluminum-Alloy Wheels, “Special Edition” Package and Nissan Navigation Package. Also, an auto-dimming rearview mirror, aluminum appearance kickplates and illuminated visor vanity mirrors are now standard on SL models, and Vehicle Dynamic Control (VDC) is standard on all models (previously SL only). 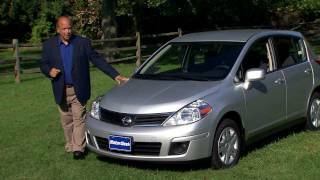 The 2012 Nissan Versa Hatchback’s crisp, youthful body form and long roofline suggest both the roominess inside and Versa’s performance capabilities. Its long 102.4-inch wheelbase and short front and rear overhangs create a sporty dynamic look. The Versa Hatchback exterior also features body-color front and rear bumpers and body-color dual remote-controlled outside mirrors. Versa Hatchback has a coefficient of drag of 0.31. Versa Hatchback 1.8 SL models add a higher level of performance styling with a roof-mounted rear spoiler, lower body side sill extensions, unique front and rear fascia and standard fog lights. 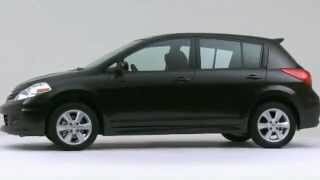 The 2012 Versa Hatchback is available in nine exterior colors: Red Alert, Metallic Blue, Blue Onyx, Espresso Black, Brilliant Silver, Magnetic Gray, Super Black, Fresh Powder and Arctic Blue. Every 2012 Versa Hatchback comes equipped with a standard 1.8-liter DOHC 4-cylinder engine rated at 122 horsepower and 127 lb-ft of torque. Three transmissions are offered – a 6-speed manual (1.8 S), an electronically controlled 4-speed automatic with overdrive (optional 1.8 S), and Xtronic CVT™ transmission (standard on 1.8 SL). Fuel economy for the 2012 Versa Hatchback is rated at 28 mpg City/34 mpg Highway with the Continuously Variable Transmission; 24 mpg City/32 mpg highway with the 4-speed automatic transmission; and 26 mpg City/31 mpg Highway with the 6-speed manual transmission. All 2012 Versa Hatchbacks are equipped with an independent MacPherson strut front suspension and torsion beam rear suspension, with front and rear stabilizer bars. Other standard equipment includes Electric Power Steering and power-assisted front disc/rear drum brakes and Anti-lock Braking System (ABS) with Electronic Brake force Distribution (EBD) and Brake Assist (BA). Vehicle Dynamic Control (VDC) is also standard. Versa Hatchback 1.8 S models feature 15-inch styled steel wheels with covers and P185/65HR15 Continental all-season tires. Versa Hatchback 1.8 SL models offer standard 16-inch aluminum-alloy wheels with Continental P195/55R16 all-season tires, while 6-spoke 15-inch aluminum-alloy wheels are optional on 1.8 S models equipped with the 4-speed automatic transmission. In Versa, Nissan’s design and engineering teams found a way to fit a large interior in a compact car. Interior length, front to back, is more than six feet, while the 60/40 split fold-down rear bench and large cargo area add versatility for owners with highly active lives. Along with a spacious cabin, Versa offers a clean, simple, high-quality interior design and excellent craftsmanship. Comfort is a priority for all passengers. The wide, laterally oriented instrument panel underscores Versa’s width, while the low center console flows freely toward the rear, giving a sense of the interior’s length. Versa gauges feature an attractive “dimensional” appearance and white illumination. Interior illumination is a welcoming reddish orange color. The interior design also integrates convenient storage solutions, including in the center console, glove compartment, front doors and an in-dash storage compartment. 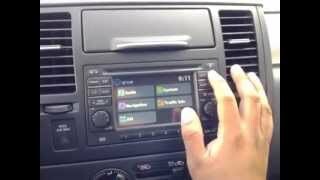 The 2012 Versa Hatchback comes with a long list of available technology, including available Nissan Intelligent Key®, Bluetooth® Hands-free Phone System, XM® Satellite Radio (XM® subscription required, sold separately) and Nissan Navigation System with XM NavTraffic® Real-Time Traffic Information (XM® subscription required, sold separately). Safety features include the Nissan Advanced Air Bag System (AABS) (includes dual-stage front supplemental air bags and front seat side-impact supplemental air bags for chest protection), and standard roof-mounted curtain side-impact air bags for front and rear outboard occupant head protection. Additional safety features include standard LATCH (Lower Anchors and Tethers for CHildren) system, child safety rear door locks, child seat upper tether anchors, front seat Active Head Restraints, Vehicle Dynamic Control (VDC), Traction Control System (VDC) and Tire Pressure Monitoring System (TPMS). 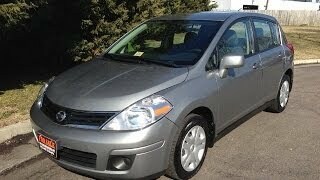 The 2012 Nissan Versa Hatchback is offered in 1.8 S and 1.8 SL models. Versa 1.8 S includes standard 4-speaker 90-watt AM/FM/CD audio system with auxiliary audio input jack, power windows and door locks, power rear hatch release, ABS and more. Versa Hatchback 1.8 SL models include sport front and rear fascias, rear decklid spoiler, fog lights, 16-inch aluminum-alloy wheels, woven cloth seats, front center armrest with soft pad, Nissan Intelligent Key®, Interface System for iPod®, tonneau cover and much more. Available options packages include the Plus Package, with Remote Keyless Entry and cruise control; 15-inch Alloy Wheels; the Convenience Package, with Bluetooth® Hands-free Phone System, audio system with iPod® control, steering wheel audio and Bluetooth® switches, leather-wrapped steering wheel, map lights with sunglass holder, fabric headliner and visors, and tonneau cover; and the S Navigation and SL Navigation Packages. The Special Edition Package includes the contents of the Plus Package, 15-inch Alloy Wheels and Convenience Package, along with a “Special Edition” badge.